How many tonnes of water are there in an Olympic size swimming pool? What is the mass of a grain of granulated sugar? A young ostrich that weighs 100 kg is travelling at 54 km/h. Linear momentum is defined as p = mv where m is the animal's mass and v is its velocity. What is the magnitude of v in SI units? What are the dimensions of p? where a is the radius of the aperture, D is the distance from aperture to screen and λ is the wavelength. What are the dimensions of a, D and λ? Hence, what is the value of x required to produce a dimensionless quantity? 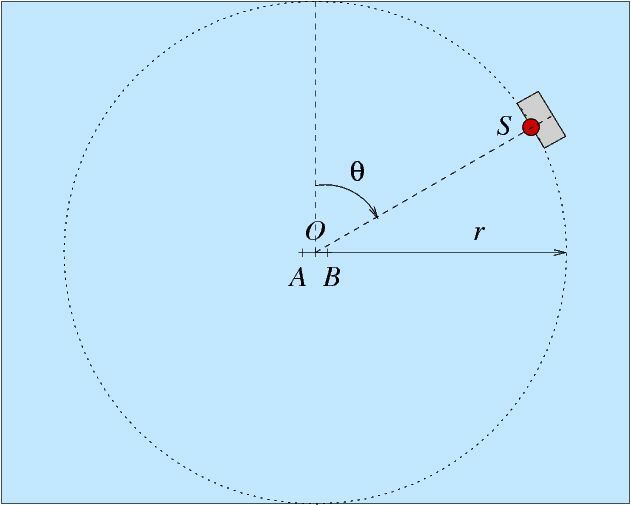 where θ is the angle between the plane of the slope and horizontal. Fig. 1.1: Block on a slope with unit vectors i and j (left), and p and n (right). Calculate force F in terms of the unit vectors p and n for a block on a slope, as in Fig. 1.1 (right). Review the questions and answers to the quiz we did in class, s06quiz1.pdf (on campus only). A 4m-by-2m box is at rest on two simple supports, as shown in Fig. 1.2 (left). The Origin is placed at its centre of gravity where its weight provides a force W = 12 (-j) N. The supports are positioned at (-1,-1) and (1,-1). Calculate the size of their reaction fores R1 and R2 respectively. Fig. 1.2: Box with symmetric (left), and asymmetric (right) mounts. Considering moments about O, find the new reaction forces when the first support is re-located at (-2,-1), as in Fig. 1.2 (right). A force F = 3 i−6 j N is applied to the handle of a spanner at r = (2,-1), as shown in Fig. 1.3. What is the length of r? What is the angle between the handle of the spanner and F's line of action? What is the size of the torque applied to the nut at (0,0)? What is the direction of the equivalent torque vector? Fig. 1.3: Force applied to a spanner to produce a torque. if F rotates with the spanner, keeping the same magnitude and relative angle. Claire cycles up a hill at a constant velocity on a 1-in-10 gradient at 5 m s-1. She weighs 75 kg and her bike 25 kg. What power is she doing against gravity? How many joules of work are done in one minute? The 1:5 gear ratio of the Claire's bicycle (as in the previous question) means that for every centimetre the pedal moves, the bike moves forward five centimetres. Claire applies an average pedal force of 600 N and the crank for the pedal is 12.5 cm long. What is the rate of work that Claire is putting in? What is the mechanical efficiency of the bicycle (considering the work in and work done against gravity)? Calculate the magnitude of the input torque at the pedals. Having stopped to admire the view at the top of the hill, she now freewheels back down the 1-in-10 hill without pedalling. What will be her initial acceleration when she sets off? When she has attained a constant speed (i.e., at terminal velocity), what will be the total amount of drag force from friction and air resistance? 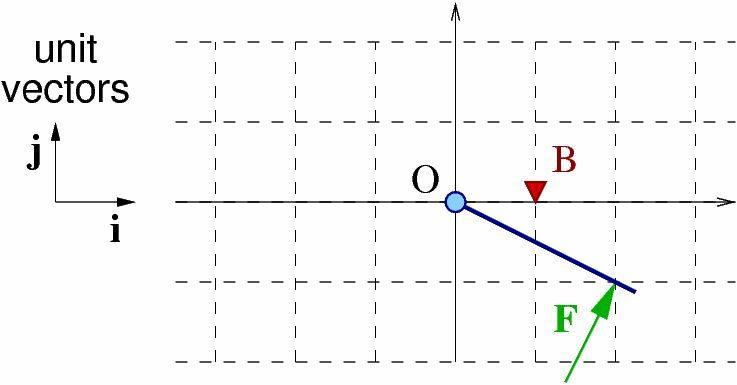 Using the equation for the drag force, D = ρ v2 CD A / 2, where density ρ=1.2 kg/m3, drag coefficient CD=1, cross-sectional area A=0.5 m2, calculate the magnitude of the terminal velocity v∞. Hence, determine how much kinetic energy is left when she arrives at the bottom of the hill. Consider a Fiat 500 car that weighs 1 tonne. Ignoring the effect of the shock absorbers, calculate the total spring stiffness needed to give the suspension a natural frequency of 1 Hz. What is the required stiffness for each of the four wheels? 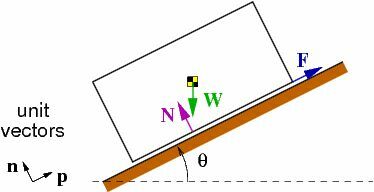 What is the size of the force required to cause a deflection of 10 cm to the whole car? A guitar string of length L = 1 m with mass density μ = 0.1 kg/m is given a tension T by a mass of 10 kg hanging over a pulley. Given that the equivalent stiffness is k = T/L and the effective mass is m = μ L / π2, use the principles of SHM to deduce the fundamental frequency of the string resonance (i.e., the note that it plays). 1. 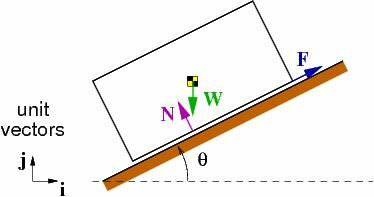 An omnidirectional sound source S with an acoustical power of 0.4 W is located at (2 cos 30°, 2 sin 30°) in a horizontal plane, i.e. at a distance of r=2 m at an angle θ=+60° to the right, as shown in Fig. 2.1. Calculate the sound intensity at the origin (0,0), assuming free-field propagation. Express this as dB SIL, using Iref = 10-12 Wm-2. Repeat this calculation for points A and B at (−0.1, 0) and (+0.1, 0) to obtain a value for the intensity difference (in dB) recorded between two microphones placed at these points. Figure 2.1: Plan view of a sound source in a room. 3. Describe how loudly the sound source will be perceived by a human ear placed at B as the frequency of a sinusoidal signal emanating from S is varied from 20 Hz upto 20 kHz. calculate the duration that would give a noise exposure equivalent to the daily dose limit (i.e., 90 dBA SPL over 8 hours). Figure 2.2: Plan view of a sound source in a room with a human listener at the origin. at what frequency would you expect to see a transition in the diffraction behaviour of sound waves impinging on a human head (assume D=20 cm)? Figure 2.3: Sound arriving at the listener's ears. for a digital signal sampled at 44.1 kHz, express the delay in samples. 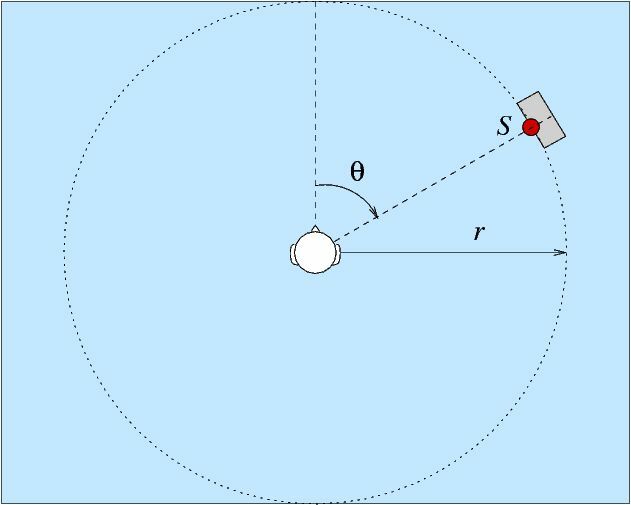 Figure 2.4: Image sources used to model the first three early reflections. 7. 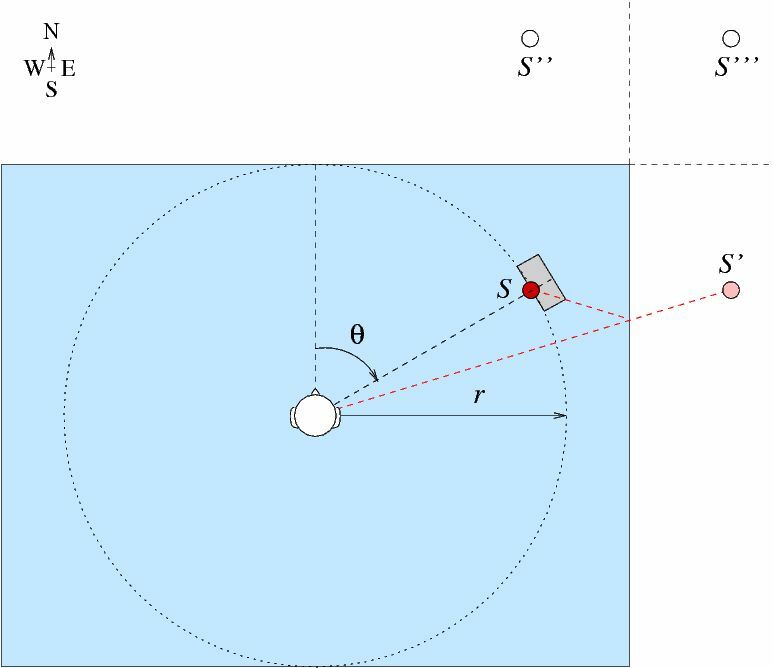 Considering lateral reflections of S in a 5 m (X) × 4 m (Y) × 3 m (Z) room, arriving at the centre O from the right-hand side, determine the distance, intensity and delay of the first three reflected responses, the so-called early reflections (as shown by the image sources in Figure 2.4). Assume an average absorption coefficient of α=0.5 on each reflection. 9. Compare these values to the distance, intensity and delay of the direct sound, as calculated in Q. 1 & 2.